Perhaps one of the most iconic watches sold today, the Panerai was probably the driving force behind mainstream oversized watches. This model the PAM 111 from their Historic series, was bought from an authorized dealer in 2010. The watch comes with everything it left the factory with, all 3 boxes, hang tags, polishing cloth, screwdriver, Chronometer certificate and warranty card. This watch as hardly worn by the previous owner who had the original strap replaced with a thinner aftermarket unit so the original factory leather strap shows little to no wear. 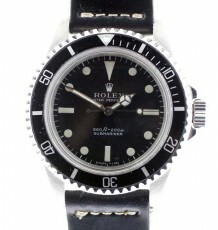 Please look at all the photos below that document this wonderful watch. Please note that I have darkened the last 2 numbers of the serial. 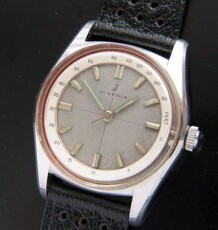 This model uses the historically correct sandwiched dial technique for displaying the luminous numbers. 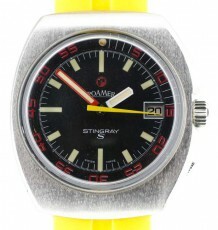 Earlier models simply has the luminous painted onto the dial surface. 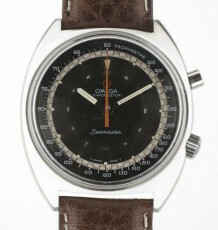 The watch is as clean as you will find if not bought new. Please feel free to email any questions you may have about this beauty. 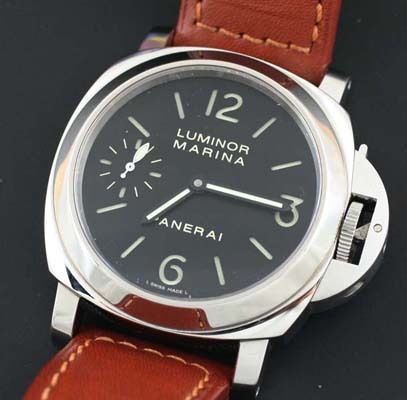 The History of Panerai is well documented and their heritage was uniquely integrated with the Rolex Watch Company during the Second World War period.